Effective optical communications requires 1550 nm IR, which is received and converted into an electrical signal for computer processing. Fast light-to-electrical conversion is thus essential for high-speed communications. According to quantum theory, 1550 nm IR has energy of ~ 0.8 eV, and can only be detected by semiconductors with bandgaps lower than 0.8 eV, such as germanium (0.66 eV) and III-V compound materials such as InxGa1-xAs (0.35-1.42 eV) and InxGa1-xSb (0.17-0.73 eV). However, those materials usually have huge crystal defects, which cause substantial degradation of photoresponse performance. The minimized crystal defect is achieved by a "catalyst epitaxy technology" first established by Ho's group. Briefly, the III-V compound nanowires are catalytically grown by a metal catalyst such as gold, nickel, etc. 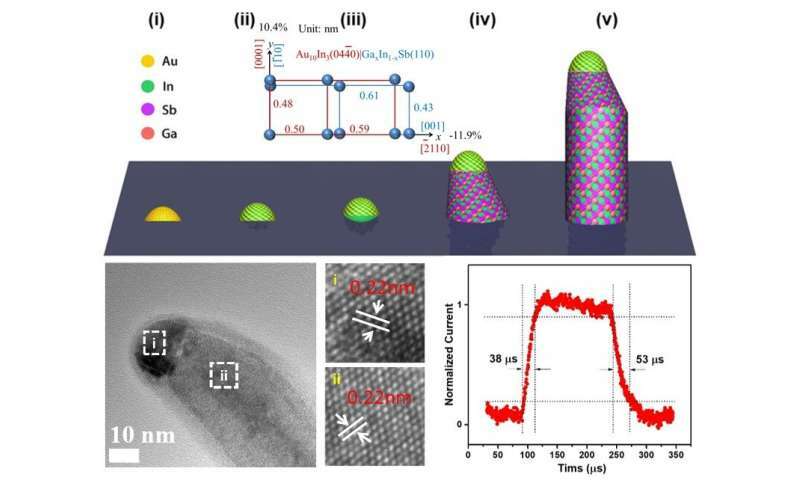 "These catalyst nanoparticles play a key role in nanowire growth as the nanowires are synthesized layer by layer with the atoms well aligned with those in the catalyst," said HAN Ning, a professor at IPE and senior author of the paper.